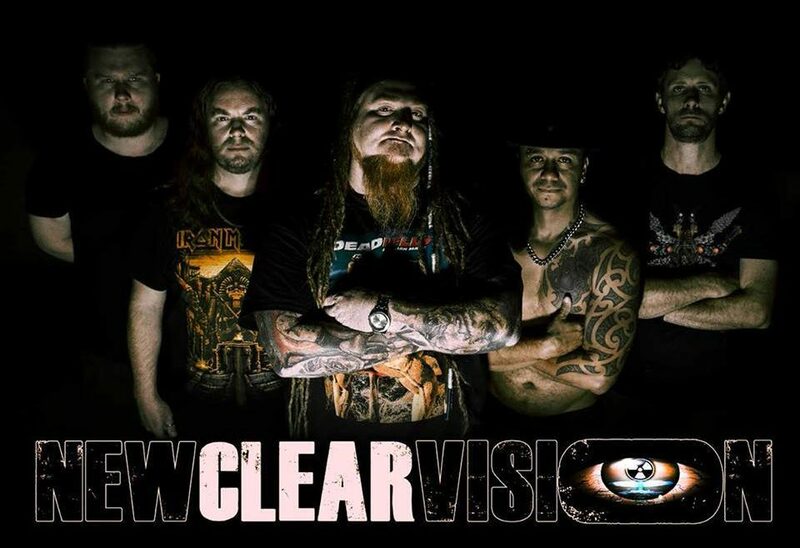 Home » Features » New Clear Vision: Meet Queensland’s New Metal Heroes! When one thinks of the Sunshine Coast in Queensland, Australia (if you’re not Australian then you’ve probably never even heard of the place) it’s things like Australia Zoo, the Glasshouse Mountains and kilometers of pristine beaches teeming with scantily clad women – and let’s not forget the occasional old fella in budgie smugglers – that springs to mind. New Clear Vision are a band born from sunny beaches and sun swept dunes… although judging by the album cover it seems more like they were summoned from the deepest darkest crevices of hell! The band was formed in 2015 by a collection of talent from other local bands; Brad Bromfield (vocals & former Messiam), Adam Kane (guitar & current Wisdom’s Realm), Shannon Wells (guitar & former Rosetta’s Stone) and CJ Nash (drums & former Desolution). With a “New Clear Vision” for the future, they embarked on a new musical journey. While tracks such as “13” and debut single “No More Screams” are closer to death metal than anything else – and expose the bands inner working as a purebred heavy metal machine – there’s certainly more to them that just that. Although the album is short – just 25 minutes – there’s no shortage of variety squeezed in. Hip-hop/rap influences shine through in many of their tracks, and at times, they sound something like a heavier version of Rage Against the Machine. “My Reprisal” and “So Close To Death” are both great examples of there hip-hop/rap and metal fusion coming together to create a rather unique listening experience. Looking to the future, the dream is that this humble little project can gather enough momentum to book them a place on tour with some of the more established bands they turn to for inspiration, such as Body Count and (həd) p.e. Bromfield said even getting to the United States and, in particular, heavy metal hubs like California would be a dream come true. “If anything though,” says Bromfield “we would just like to make a few more albums and get whatever recognition we deserve worldwide”. New Clear Vision have laid a solid foundation for themselves, and now they must capitlize on it. Will they achieve their dreams? We don’t know, but what we do know is that people have certainly dreamed of crazier things and gone on to achieve them. The band is still merely in it’s infancy, but they show a great deal of promise for the future and we will certainly be keeping an ear out for new releases from this Sunshine Coast outfit! I am an Australian University student with a passion for metal and a hobby of writing. I often find myself with too much spare time on my hands (somehow), so here I am!